There’s a small subset of the population that knows exactly what their true calling is. They started on it early and are now reaping the rewards of their focused efforts. Bow down to Queen Bey. For the rest of us, it’s difficult to identify the one thing we love and pursue it like a bloodhound. Our multi-passionate nature gets us easily distracted, but focus is the key to greatness. Good news. 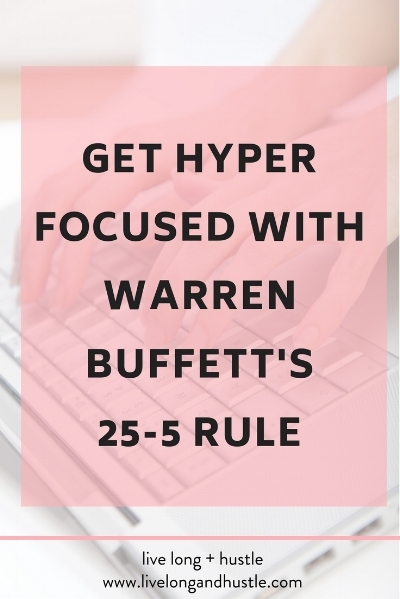 I have an exercise for you that will get you hyper focused and even better news, you don’t have to bust your brain to find just one thing to pursue. List 25 things you want to do in the next 10 years (feel free to switch up the timeline). Jot down whatever comes to mind – relationship, career, travel, skills, awards, fitness, etc. 25 might sound like a lot, but once you start, you’ll see that it’s not that difficult. This exercise is so powerful because you’re identifying the things that you like enough to get easily get drawn to them. They are the source of that scattered feeling. Before you get separation anxiety, don’t worry, you’re not saying bye forever. Whenever you accomplish one of your top 5, replace it with something from your “not-to-do list” or start the exercise from scratch. Remember, your list is going to be ever changing, just like you. With the "not-to-do list" out of the way, you know exactly what your top 5 priorities are within a specific timeline. Schedule time for your top 5 and focus on them like there’s nothing else that matters, because there isn’t.